Post Malone cleans up nicely. The rapper, 23, was looking dapper on Tuesday evening for a night out in Boston. 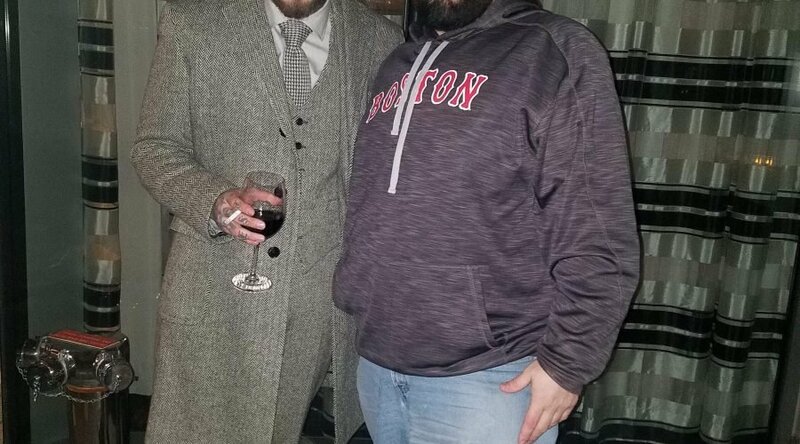 Dressed in a three-piece herringbone suit and matching full-length coat, Malone was spotting hanging out outside Strega Waterfront in the city’s Seaport neighborhood. Malone headed to the restaurant with several friends, his agent, and frequent collaborator Louis Bell. As for his order, Malone feasted on chicken parmigiana with homemade rigatoni, and sipped a glass of 1982 Bordeaux Chateau Lafite Rothschild, which runs $3,500 per bottle. He didn’t hesitate to praise his meal to the restaurant’s owner, Nick Varano. Malone’s visit to Boston is due to his role in Wonderland, a new Netflix crime drama directed by Peter Berg. On Monday, the rapper headed to the city of Lynn, about 10 miles north of Boston, to film a prison scene in a shuttered school alongside Mark Wahlberg. When he went outside to smoke a cigarette at dinner on Tuesday, Malone gladly snapped photos with fans, and chatted about his acting debut in the film. “He said he stabbed Mark Wahlberg in the movie,” a bystander told PEOPLE. Earlier on Tuesday, Wahlberg shared an Instagram photo of himself on set with Malone in prison garb, alongside director Peter Berg. The film is based on the Ace Atkins book of the same name. Wahlberg plays the iconic Spenser character, a private eye made famous in the Robert B. Parker novels and in the classic 80’s show Spenser for Hire.